This cover is a simple and sweet looking one, and I just adore it! In fact, I almost want to throw it on top of a black background to see how well the design of the night sky pops. The colors used in the background are just gorgeous! Also, I have a thing for covers with a lot of white background (or any other solid colored background, but especially white). For some reason, I feel like the illustrations stand out more this way--although not all of the ones I've come across work, but they're certain to be more likely to catch my attention. 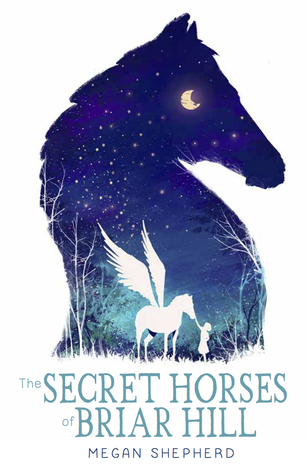 The Secret Horses of Briar Hill is a children's fantasy that will be published in October of this year. Click on the cover for more details at Goodreads.